Deering Banjos is to be honoured in the Fretted Instrument Guild of America Hall of Fame. The Fretted Instrument Guild of America (FIGA) will be honoring the Deering Banjo Company at their annual convention in Oklahoma City, during the weekend 13th to 16th July. Deering Banjo Company is being inducted into the Hall of Fame because of their association with the vintage trademark Vega. This over 100 year old trademark has been part of the Deering Banjo Company since 1989 and they have upheld the strong traditions of the historical line of banjos for decades. Greg and Janet Deering will be at the event to receive this honor and are bringing a broad selection of Deering banjos for display in the vendor area of the Sheraton Bricktown Hotel location. The event is open to the public and it is a wonderful opportunity to see a choice selection of American 4-string , 5-string and 6-string banjos made by the Spring Valley, CA, based company. Greg Deering will be presenting The History of Deering & Vega Banjos workshop at 11:–am on Friday, in the Great Plaines Meeting Room, and on Saturday from 9:00am, banjo enthusiasts have the opportunity to hear Greg Deering talk about How to Set Up Your Banjo for the Best Tone in the Red Carpet Meeting Room of the Sheraton Bricktown Hotel. There are many special events planned for the weekend among which is a special outdoor concert on Saturday night, 16th July, in the parking lot at the corner of Oklahoma and Sheridan. This family friendly event is free to the public. Bring a lawn chair and enjoy performances by the All Stars Youth Banjo Band, Ken Aoki, Cynthia Sayer, Doug Mattocks, Debbie Schreyer, and the Micky Finn Show. FIGA is a non-profit musical organization with a world-wide membership of banjo, ukulele, mandolin, and guitar players and fans. This convention in Oklahoma City is a rare chance to meet Janet and Greg Deering, see a unique selection of Deering banjos and meet some of the world’s renown jazz banjo artists. Visit the FIGA website for more details. A few months ago we posted an article from the Deering Banjo Company’s newÂ website on how to tension your banjo head. This was quite useful if you happen to play a banjo, but not so if you’re a mandolin player. ThisÂ month Deering Banjos has postedÂ an article on banjo bridges. The lyrics like a bridge over troubled waters might well have been written by a banjo player and his search for the Holy Grail of bridges for his banjo! Bridges do play a critical role in the sound of a banjo. Thick ones, thin ones, compensated ones, which is best? That is something every banjo player can decide for themselves but there are a few basics that I hope can help lead you to the best choice for your playing needs. While many banjo enthusiasts admire fast banjo playing, it isn’t always clear how to train to play fast, effortlessly and with precision. Speed and dexterity will be loosely described here as a kind of familiarity. Familiarity is usually created when we repeat something, comfortably, slowly and regularly. Do you know what the easiest, simplest concept is in speed training? When you practice slow, you learn fast. When you practice slowly, your speed increases without trying to do so. That is why students practice with a metronome, to prevent speeding up beyond their comfort level. When you practice too fast, you introduce un-wanted muscle tension and therefore, bad habits. 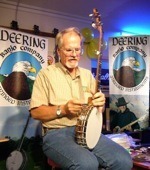 See the Deering Banjo Website for more information. Here’s a great article from the Deering Banjo Company. DeeringÂ has issued a challenge to novice banjo players and for that matter anyone who has not taken time to adjust or tinker with the head tension of their banjo. Many novice banjo players are hesitant to adjust their banjos in any way. I spoke to one owner who had his banjo for 3 years and had never tightened the head. We hope this article will help you gain the confidence to work on your banjo head tension and find joy and power in the knowledge that you can do it – Carolina Bridges. Read the article on the Deering Banjo Website. The Eagle II from Deering Banjos. Featuring their new Twenty-Ten Tone Ring, The Eagle II banjo is a whole new breed of banjo. It features a maple rim and mahogany resonator, ebony fingerboard and the ground breaking, patent pending Twenty-Ten Tone Ring which is a completely original Deering design that is unlike any other traditional tone ring. It produces a high quality sound that is versatile for many styles of playing. While the sound is uniquely Eagle, it represents a refinement in the quality of banjo tone, something that allows the player to soar to new heights. The Eagle II is available from Zenith Music, 309 Stirling Highway, Claremont, Western Australia. Phone: (08) 9383 1422 or email. Deering Banjos has announced the launch of their new Deering website with features that make it easier to find out about your favorite banjo, order unique and useful accessories like books, CDs, parts, tools, or find our online manual, FAQs, and other pointed information to make your banjo playing more fun. Deering intends to update the site often so we have bookmarked it and will keep checking back to see what is new. Deering has has announced a new original Deering patent-pending tone ring design that has been created from a special brass alloy. Deering’s new maple ‘Eagle’ banjo sings with an unexpected brightness, clarity, and powerful projection that most listeners will be stopped in their tracks! Everything about the Eagle banjo is new and different – Deering Banjos. The traditional Deering flange design has been replaced with a shoe and plate style flange with the Eagle hole pattern which is a softly flowing 6-pointed ribbon pattern evenly spaced throughout the nickel plating. The maple wood of the neck and resonator are stained in a rich brown and enhanced with a high gloss finish. The banjo also features a new engraved inlay pattern designed by Greg Deering in a Victorian style dresses the ebony fingerboard. This newest inlay illustrates not only the master’s touch, but is a salute to the rich traditions of early-American art and banjo craftsmanship. You can read the full article on the Deering website.